Home / local news / Opinion / Trending Now / Leni Robredo on Pres. Duterte's administration: "We tried, we tried to disrupt.."
Leni Robredo on Pres. 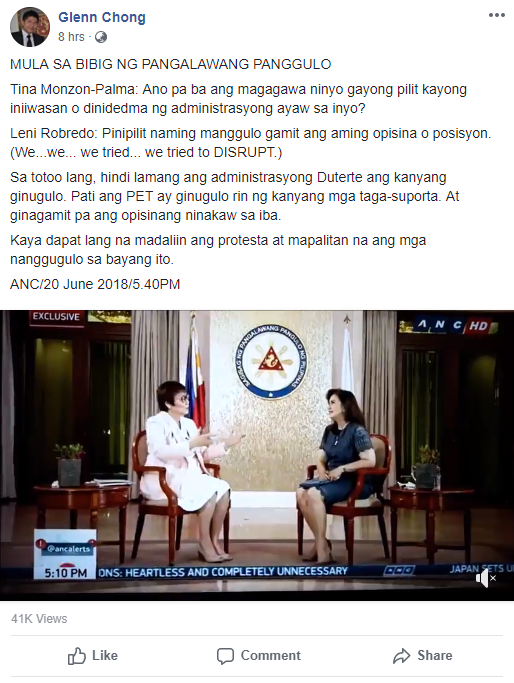 Duterte's administration: "We tried, we tried to disrupt.."
Glenn Chong, an election lawyer and former Liberal party member once again took to social media and shared his opinion on an interview made by ABS-CBN News Channel (ANC) to Vice President Leni Robredo. Atty. 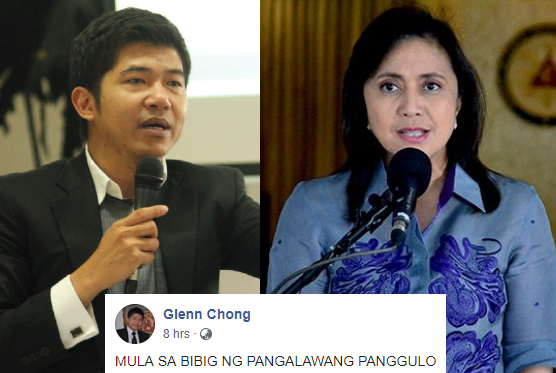 Chong, a former Congressional representative, posted on his Facebook page and uploaded a video clip of the said interview of Tina Monzon-Palma, ANC news anchor to Vice President Leni Robredo. 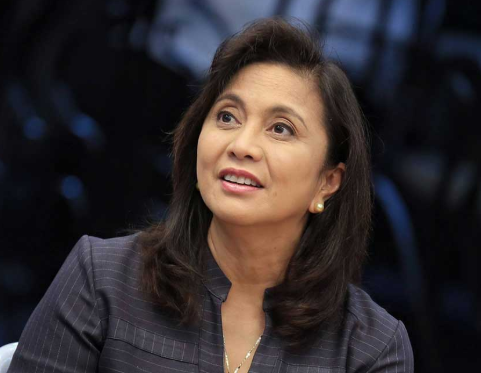 On his post, the lawyer showed his dismay over the vice president's answers, particularly when asked what else can she (Robredo) do to make a difference to the present administration. 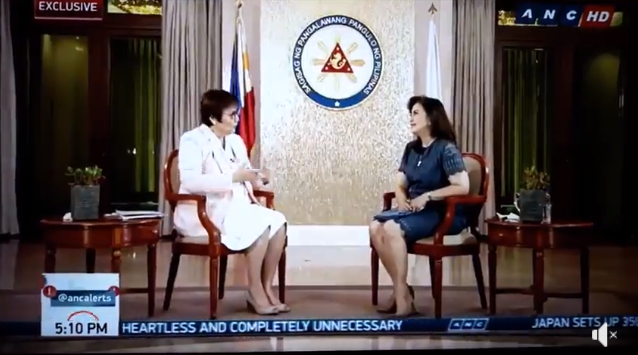 Based on the video, VP Robredo, without thinking any further, answered the question and said that they are actually trying to "disrupt" in the manner by which their office has position. "We tried, we tried to disrupt in the manner by which ahh.. our office has position itself..", she said. Now, Atty. 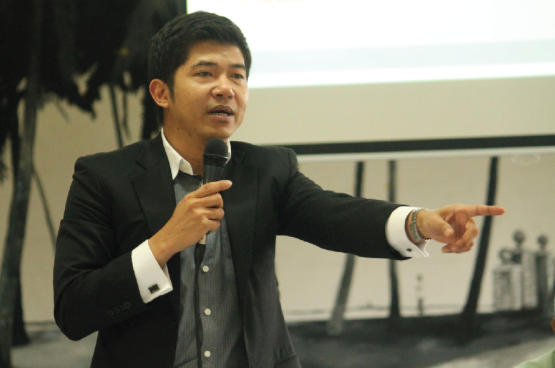 Chong, upon seeing the said interview expressed his displeasure to Robredo and said, truly, the vice president is not just disrupting the Duterte administration but even the Presidential Electoral Tribunal (PET) is also being disrupted by her supporters. The lawyer then ended his post by saying that the protest for vice president recount should be quickend for the government to get rid of these county's troublemakers. "MULA SA BIBIG NG PANGALAWANG PANGGULO"
"Tina Monzon-Palma: Ano pa ba ang magagawa ninyo gayong pilit kayong iniiwasan o dinidedma ng administrasyong ayaw sa inyo? 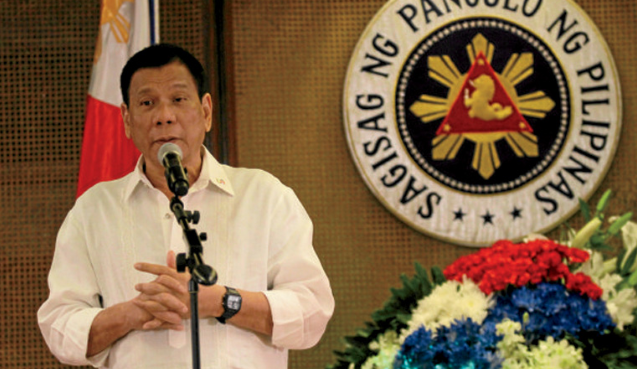 Sa totoo lang, hindi lamang ang administrasyong Duterte ang kanyang ginugulo. Pati ang PET ay ginugulo rin ng kanyang mga taga-suporta. At ginagamit pa ang opisinang ninakaw sa iba. Kaya dapat lang na madaliin ang protesta at mapalitan na ang mga nanggugulo sa bayang ito."